I have had many delightful experiences with museum visitors during my nine years as a docent, but one encounter stands out. “But I did something very bad when I started working there”. According to my visitor, the minimum age for working at Schuckl Cannery was fifteen, but because her family was poor and would not be able to buy clothes or shoes for her for the upcoming school year, she pretended to be the minimum age for hiring. And although that had happened nearly eighty years before, she still felt guilty about her “lie”!! 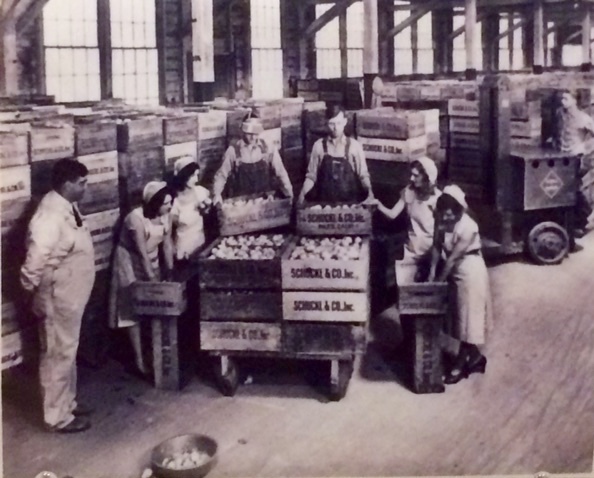 In the past century, when fruit ripened in the orchards every summer, Sunnyvale canneries offered employment to high school students, housewives and others who needed the extra work. Throughout several decades of the 20th century, including the years of the Depression and World War II, many people eagerly snapped up those jobs. During my years as a docent I have met other, older museum visitors who echoed the need to earn money for school clothes and other necessities when they were young. The canneries in Sunnyvale and in the rest of the valley played an important role in helping people earn the extra money, so desperately needed during the tough economic times of decades past. I’m certain my museum visitor was not the only young person to “change the facts” in order to be hired to work at the canneries. This entry was posted in Blog and tagged cannery on July 8, 2017 by Margarete Minar.